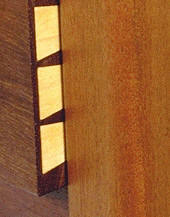 Murphy's Fine Woodworking has been a leader in the Arts & Crafts style of furniture since 1986. Our designs have won awards at numerous shows across the county. We also specialize in custom designs to fit your home and our design group has been rated as outstanding. We produce individually handcrafted furniture of exceptional grace and beauty. 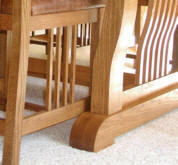 We use the finest hardwoods and traditional joinery techniques to build pieces of rare quality and lasting value. Our repertoire ranges from unique table designs to custom home and professional office suites. Much of our work involves custom designs developed to meet the specific and unique demands of our clients. Each piece is built, from scratch, by the hands of a single, dedicated craftsman, and then signed and dated. This ultimate act of accountability ensures commitment to detail that is evident in everything we do.